For years, Yvonne has been developing a sustainable homestead complete with chickens, food plants, on-site water, solar power, and more. Mulberries and some are ready to pick. 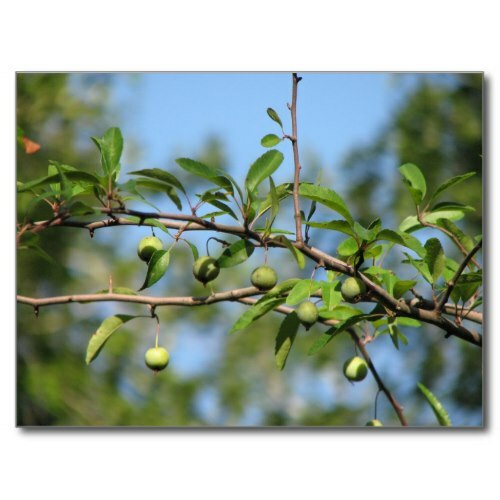 Ever since we were children, we have loved the fruit of native plants. Now, with the Green movement and the increased use of native plants in landscaping and sustainable gardens, those delicious fruits are available to more people. Here we provide useful information and easy recipes for using some of our favorite wild fruits including blueberries, blackberries, crabapples, mayhaws, grapes and mulberries in jam, jelly, cobbler and more. If you don't have access to wild fruits or don't grow your own, then domesticated fruit can be substituted in most of the recipes. All the photos on this page (unless otherwise noted) are the property of Y.L. Bordelon (aka naturegirl7) All Rights Reserved. 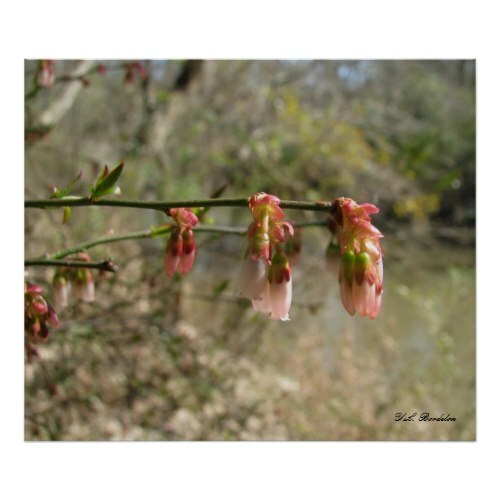 Many of the photos seen here can be purchased in Naturegirl7's Zazzle Shop as print-on-demand products such as posters, cards, apparel, mugs, etc. "Famous fruits imported from the East or South and sold in our markets ... do not concern me so much as many an unnoticed wild berry whose beauty annually lends a new charm to some wild walk or which I have found to be palatable to an outdoor taste." Some of my fondest childhood memories involved heading out to the blackberry patch with Mom and my sister and brother to pick until our buckets were full or until my little brother's face and shirt were purple, whichever came first. After the fruit was picked, we girls learned how to preserve the fruit as we helped Mom in the kitchen. We also learned how to use the fruit that we picked in a variety of delicious ways. And yes, before you think it, I was raised in the country. I lived most of my adult life in the city, but always yearned to move back where the air is fresh and there's room to spread out, and luckily that dream has come true. With the Green movement and recent "back to natives" and sustainable gardening trends in full swing, I thought that some of the knowledge I learned at my mother's knee might be appreciated, so I have put together some information and recipes about some of my most favorite native fruits. I hope this will be the first of a series about identifying and using edible native plants. And now, on to our Favorite Wild Fruits. I own this book. The plnt descriptions are great and the recipes are divine. My most favorite wild fruit (and probably the one that has the most beneficial properties) is the Wild Blueberry (Vaccinium species). We think that they are tastier than the cultivated varieties, especially the one they call, Elliot's Blueberry (Vaccinium elliottii). 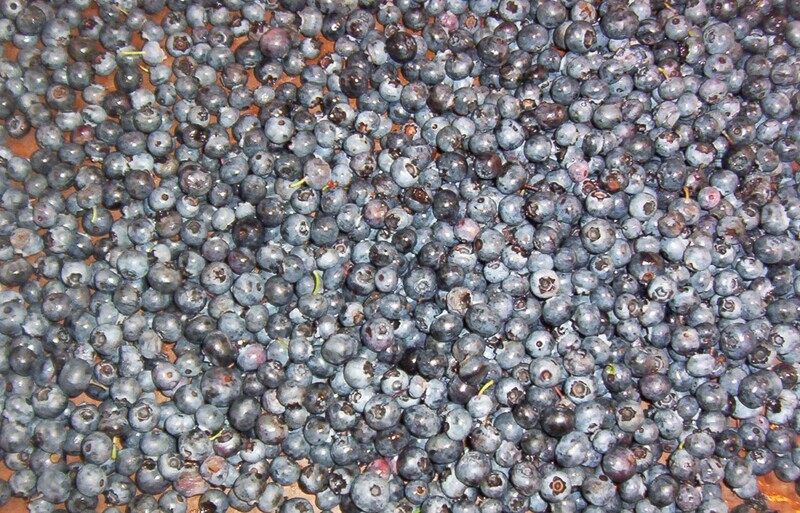 There are about 20 or more species of wild blueberries on the North American continent. The wild blueberries bloom and bear fruit much earlier than the domesticated ones. We usually are picking berries in March. 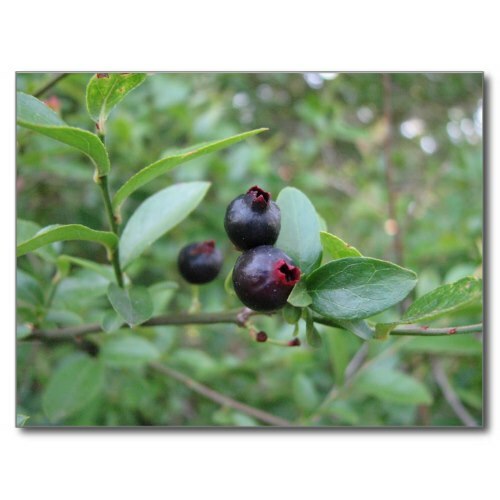 Down here in the south, we use the name "Huckleberry" and wild blueberry interchangeably, but whatever you call them they make excellent eating and can be used for pies, jellies, jams, tarts or to just pop into your mouth. Uses: fresh, cooked or dried fruit, jelly. Edibility: outstanding taste and texture, not abundant. If you want to learn more about preserving fruits and vegetables, this would be a good place to start. Blend 1/2 cup sugar and the cornstarch in medium saucepan. Stir in blueberries and lemon juice. Cook, stirring constantly until mixture thickens and boils. Boil and stir 1 minute. Add a dash (1/8 teaspoon) of almond extract. This sauce can be poured into sterilized jars and kept in the refrigerator to be used like jam on toast, biscuits, ice cream, etc. 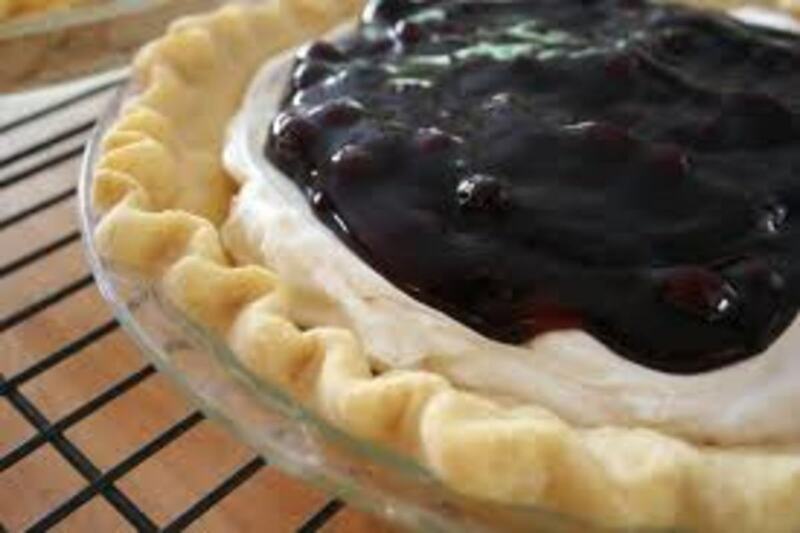 You can also pour the hot mixture into a cassarole dish, add biscuit dough and make a cobbler or use the blueberry sauce / filling in the easy cobbler recipe below. Make the batter and pour it into a greased baking dish. Pour the blueberry sauce or canned fruit pie filling over the batter. Bake at 375 degrees F for 35-45 minutes or until the crust is light brown. The crust will magically rise up to cover the filling. This covers edible plants of the Southwestern U. S.
At low speed, cream margarine, sugar and vanilla. Add eggs, one at a time, mix until well blended. Sift dry ingredients and add alternately with milk. Sprinkle blueberries with flour before adding to batter. Add Â½ cup blueberries, stir by hand. Add rest of blueberries. Grease muffin pan and grease top of pan or use paper cupcake liners. Pour mixture into pan and fill 2/3 full. Sprinkle rest of sugar on top. Bake in a 375 degree oven for 25 minutes or until done. Cool in pan at least 30 minutes before removing carefully. Makes 18-20 muffins. Wonderful recipes using cultivated and wild berries. 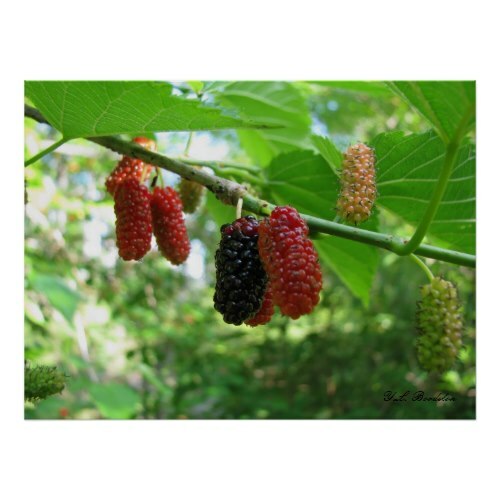 Red Mulberry (Morus rubra) is native to the United States, but the Black Mulberry (Morus nigra) has naturalized over much of the Southeastern United States since it was imported in an attempt to start a silk trade here. Both have delicious berries and other parts of the plants are edible, too. 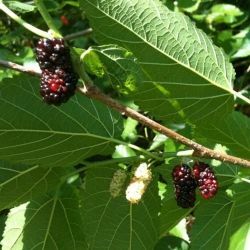 Mulberry trees are bird magnets, so if you like to have a variety of birds in your yard, then this is a great tree to have. One draw back is that the purple juice of the fruit will stain things, so the tree should not be located near a house, driveway, etc. Pick the fruit when it is ripe (usually early April in the south). One good method is to lay a piece of plastic on the ground under the tree and shake the limbs. The ripe berries fall off easily. 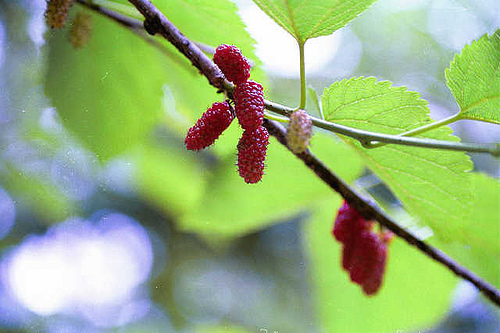 The ripe berries can be used for sauces, jellies, jams, tarts, pies or just eaten raw. Parts used: fruit, young new shoots & leaves . A tree with 3-6" fine toothed, often 2-3 lobed leaves. Twigs hairless, sap of twigs & leaf stalks is milky. Fruit is like blackberries, red then purple when ripe. Found in rich soil, open woods, & fence rows. Uses: fresh fruit, jelly, cold drink & cooked vegetable. Edibility: good quality, neither widely distributed nor abundant. These red mulberries will turn black when ripe. Wash thoroughly 2 pounds of fully ripened mulberries. Add to a deep saucepan, add a little cooking water and bring to a boil. Simmer for 20 minutes, keeping the pot covered. Remove from the heat and strain the juicy pulp through a food mill. This will remove the seeds and skins. You can also use the Blueberry Sauce and the Easy Fruit Cobbler recipes and substitute Mulberries for the Blueberries. The United States has many different species of grapes. In the Southeast, where we live, the Muscadine (Vitis rotundifolia) and the Summer Grape (Vitis aestivalis) are the most popular. 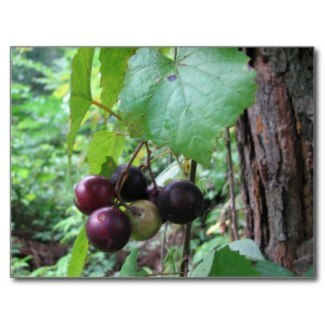 The Muscadine is the most prized because of its large size and flavor. The Summer Grape is a smaller grape and occurs in large clusters. Muscadines and Summer Grapes ripen from mid to late summer down here in the South. They should be picked when they are fully ripe, although some partially ripe ones are good if you are making jelly. The leaves of the grapevine can be used in Mediterranean dishes, like stuffed grape leaves. 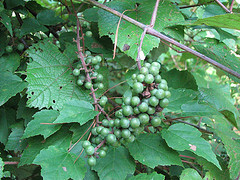 Muscadines are grown in gardens all over the South. The trick is in the pruning because grapes need new growth on which to flower and bear. Vines that climb with tendrils, simple, deciduous leaves with palmate veins. Found in thickets, edges of woods. 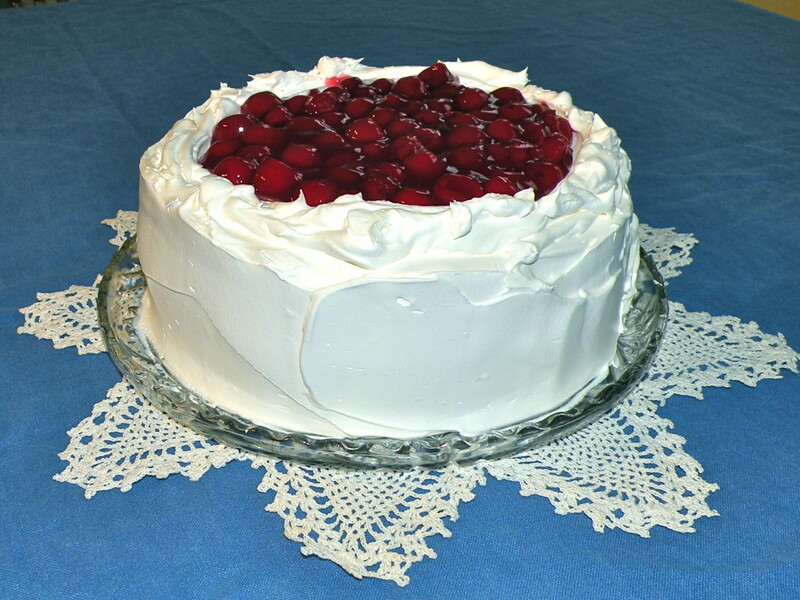 Uses: fresh fruit, jelly, cold drink, cooked green. Edibility: good quality, abundant. These will turn purplish-black in late summer. The bunches can be clipped when most of the grapes are ripe. Stem and wash 5 pounds of wild grapes. Use a ration of 3 pounds partially ripened grapes and 2 pounds of fully ripened grapes. Place into a deep saucepan and crush with a potato masher. Add 1/2 cup of water and bring the mixture to a bol. Cover and simmer for 15 minutes. 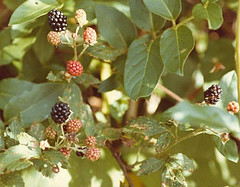 Blackberries and Dew Berries are an integral part of growing up in the South. Every child knew where the sweetest patch was located and visited it frequently during summer vacation. But the delicious fruits are worth the trouble, since they can be eaten raw or made into pies, jellies, preserves or even syrup. The stem tips can be steeped in boiling water for a wonderful tea. Dew berries root at the tips of canes and have single flowers. 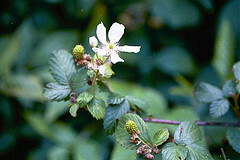 Blackberry canes don't root at the tips and have many flowered clusters. Found in alluvial soils. Uses: fruit, jelly, cold drink, tea salad. Edibility: outstanding quality, abundant. Add fresh blackberries to a blender and crush until a fine soup is produced. Keep adding fruit until 2 quarts of juice is obtained. Pour the juice through a few layers of cheesecloth, just to remove the pulp and seeds. Clean and wash the 2 1/2 quarts of fully ripened fruit. Place in a container and crush completely with a potato masher or use a food mill. Heat the mixture until the juice approaches boiling. Now allow the juice to simmer over a low heat for 10 minutes. Remove from the heat and pour the mixture into a jelly bag or cheesecloth. Recover 3 cups of the juice and place it in a deep saucepan. Add the juice of 2 lemons or 1/4 cup of reconsitiuted lemon juice. Stir well. Add 5 cups of granulated sugar and mix well. Place the mixture over a high heat and bring it to a boil, stirring constantly. Add 3 ounces of liquid pectin and bring mixture to a boil (one that you can't stir down) for 1 full minute, stirring constantly. Use the recipes for Blueberry Sauce and Easy Fruit Cobbler and substitute the Blackberries for the Blueberries. Besides recipes, this book contains information about herbal remedies. 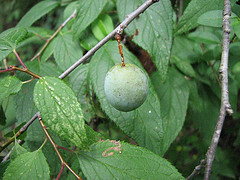 There are many species of Wild Plums in the United States and when ripe, most of them have flavor that is superior to the domesticated varieties. 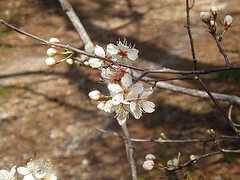 We have Mexican Plum (Prunus mexicana) and Chickasaw Plum (Prunus angustifolia) growing on our property. For jelly or jam, you should pick 80 % of the fully ripe plums and 20 % of the red, partially ripened plums (late spring to summer in the south). Wild Plums are also a good tree for the wildlife. 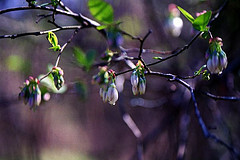 Wild plum trees add color to the spring landscape. 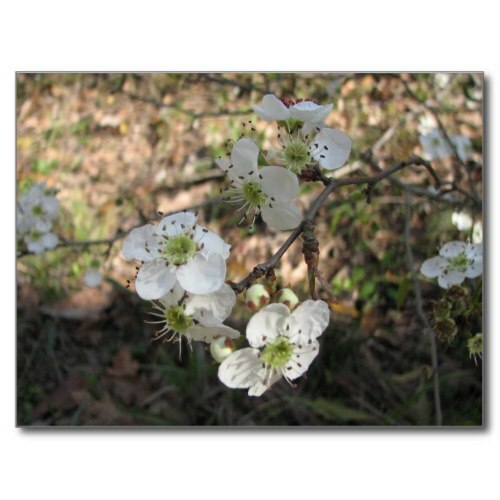 Large shrubs or small trees similar to wild cherries with small white flowers followed by large fruit (red, yellow, purplish or black) Found in thickets throughout Louisiana. Uses: Fruit & jelly. Edibility: outstanding taste, pleasant texture & healthful qualities, easy to gather, rarely abundant. 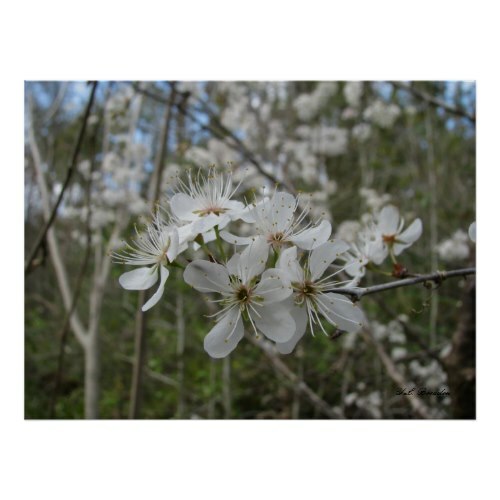 Mexican Plum trees are one of the native species growing in Louisiana. They have lovely flowers and delicious plums. Wash 3 pints of fully ripened plums, mixing in several partially ripened plums for added flavor. Place into a saucepan and crush with a potato masher. Bring the mashed plums to a boil; then simmer for 10 minutes. Remove from the heat and pour the hot plum sauce through a food mill. This will remove the skins and large seeds. 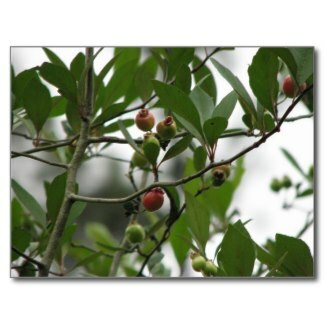 Our native Crabapple will grow in upland and low land conditions. 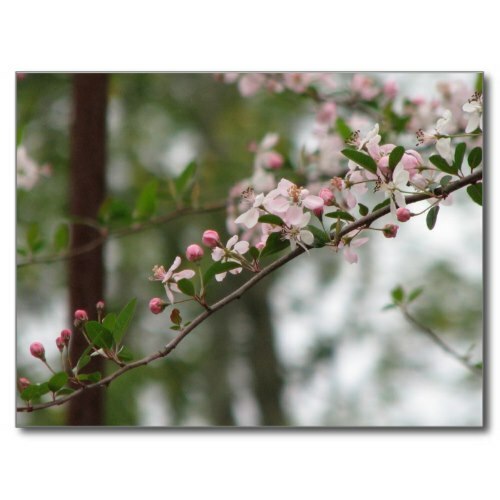 Crabapple trees are beautiful small trees that bloom lovely pale pink blossoms in the spring. These blossoms are followed by fruit of varying color and size, depending on the type of crabapple. Our Southern Crabapples (Malus angustifolia) are about the size of a small plum and are yellow when ripe. The fruit can be collected in late summer and fall, depending on what zone you live it. They make great jelly and preserves. The fruit is also eaten by a lot of different animals, so Crabapples are good trees to plant for the wildlife. The fruit turns yellow when ripe. Large shrubs or small thorny trees with pinkish-white flowers followed by large greenish yellow or reddish apple-like fruit. Select 5 pounds of partially ripened crab apples, discarding any soft or rotten fruit. Remove the blossom ends and stems. Cut the fruit into thin slices, leaving the peels and cores intact. Place the fruit into a deep saucepan, add 5 cups of water, cover and simmer over a low heat for 10 minutes. Use a hand masher and crush the fruit completely, producing a juicy sauce. Allow the mix to simmer for 5-10 minutes longer. Remove from the heat, strain through a jelly bag, gently squeezing the pulp but do not force any of the pulp into the juice. Save the pulp and make jellied apple butter. Recover the juice, place into saucepan, add 8 cups of granulated sugar and stir constantly over a moderate heat until sugar is thoroughly dissolved. Then bring to a boil for 1 full minute. Pour the jelly into hot, sterile jars and seal. Prepare a light batter beating together the cornmeal, egg, water and maple syrup. Heat the oil on a griddle and drop the batter by large tablespoonfuls onto it. Immediately placing 1 blossom cluster in the center of each raw fritter and pressing lightly into the batter. Fry for 3 to 5 minutes or until golden. Flip and fry for 3 minutes on the other side. Drain on brown paper. Serve hot, sprinkled with additional loose blossoms and maple sugar. Wash and crush fruit; add water; bring to a boil and simmer for 10 min. Extract juice. Measure out 4 cups. Add lemon juice and sugar. Follow standard procedure for making jelly with liquid pectin. Certo insures that the juice thickens into jelly. A food mill is used to grind up the cooked fruit so the juice is released. "Many people think that survivalists and herbalists are not unlike a swarm of locusts swooping down on the landscape and devouring everything. This can't be further from the truth. A good survivalist and herbalist actually can do more good for any landscape than a person that does nothing at all." The lost manuscript which details many of the edible wild plants which Thoreau encountered. This is the ultimate book for the survivalist or herbalist. Visit our Naturally Native Creations Gallery to see more designs. I think wild berries make the best cobblers. WOW what a beautiful lens you wrote about the delicious wild fruits. We hardly have wild fruits growing in my country alas. What a wonderful lens. Wild fruits are so delightful - and it is so easy to ignore them. (Ha - especially if you live in the city!). Thank you for giving me so many good ideas. I love this lens ty so much as it mentions most of the fruit i love in summer and all yr long since i love to bake ahead and freeze or clean and pick and freeze. My favorite is making icecream out of these favorite fruits. This really looks good. I'm going to look for wild fruits in my area. Thank you for this idea. Great lens! Living in the mountains of Colorado, my selection of wild fruits is quite different from yours, but I, too, enjoy harvesting and using all of them! It was interesting reading about some of your favorites. Thank you for sharing this lens with us. Blessed! We are anxious to try your recipes here - sure sound tasty! Lensrolled to our "Indoor Fruit Trees" lens. 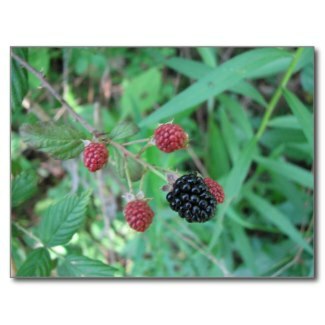 I've been enjoying wild berries since I was a little kid - nothing like free, delicious native fruits! I really enjoyed this lens - lots of great recipes, too! These sound so wonderful! I'll have to try some of your recipes sometime. Great lens. blessed by an angel. I've been picking wild strawberries in New Hampshire and now the blueberries are ripening. Time for long walks finding these. We had 4 kinds of apple trees at home when growing up...but the crabapple jelly was my favorite. Nice job on this. 5* and fav'd. What a delicious lens. All my favorite berries are here and some interesting recipes too. Love it. 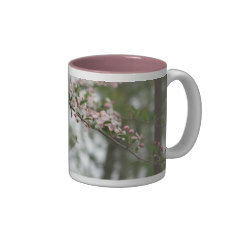 I love berries...your mugs look great! Love berries, especially blackberries and blueberries. Sweet! Thanks for the lens, well done. Great lens. We have a black berry bush in our yard. I can't wait to try out some of these recipes, but I will have to wait till next year. To bad berries don't grow all year round. Hi! You've been added to the "Squidoo lenses on edible wild plants" lens. Mmm - love wild berries! Reminds me of my childhood when we used to pick blackberries, lovely memories of getting scratched and famously falling down a bank into the road. Where I grew up (in Scotland) we had wild gooseberries that were my father's favorite to pick. It seems when I was growing up most people had fruit trees, berry bushes and grape arbors. In the name of a neater landscape the trees and bushes disappeared because folks didn't want to be bothered with the care. Now with the new respect for nature there is a resurge in interest in edible landscape. Your story about your childhood reminds me of my own. Nice lens. We haven't tried cobbler with crab apples, but we want to try it. Thank-you for the recipe. The Three Bears stopped by to pick some berries. Thank you for such a delicious treat. Beautiful lens! I'm growing grapes and berries, but the squirrels and birds usually eat them before we get a chance. Welcome to Culinary Favorites From A to Z. This is a very beneficial lens for anyone wanting to eat healthly fruits. The close up photos help to identify the various edible fruits found in nature.